Back in 2008, following Obama’s less than compelling reaction on the campaign trail to Russia invading neighboring Georgia, Sarah Palin remarked that Ukraine could be next. The left attacked her, mocked her, called her comments “strange” and “far-fetched”. Today, the scenario is very real. Russia’s puppet parliament just voted unanimously to approve military action against Ukraine. This after paramilitary forces, likely of Russian origin and backing, have already seized government buildings and airports within the Crimean region of Ukraine. Which means, all those fawning, sycophantic, Obama-protecting liberals… all those self-righteous, self-described “experts” on foreign policy… all those talking heads on the television were WRONG. Sarah Palin was right, folks. I wonder which of those supposed experts has the guts to admit it. That moment liberals realize they were wrong and Sarah Palin was right. Before the two best teams in the NFL squared off against one another, two political titans entered their own arena to do battle. Here are my five takeaways from the Obama / O’Reilly Super Bowl interview. Really? Nobody in the entire administration anticipated these problems? I find this incredibly difficult to believe. I work in the web industry. I develop web applications used by hundreds of thousands and even millions of people. I can tell you from personal experience that if my deadline was approaching and the product was not ready, I would be in regular communications with the client discussing crisis mode options. CGI Federal has taken a lot of heat for the botched rollout. Some of that they deserve, no doubt. But I suspect the #1 problem was a terrible set of specifications delivered from the government. Poor specifications leads to poor product. I also suspect that the middlemen within the Administration did not possess enough tech knowledge to comprehend the extent of the disastrous rollout. I promise you that we hold everybody up and down the line accountable. Okay, but what does this mean? Obama has told us before that he holds people accountable. Other than General Stanley McChrystal, who has Obama actually fired? Only a select few have even resigned. In the Obama administration, you can oversee the Fast and Furious scandal, lie about the cause of the attack in Benghazi, lie to Congress about the government’s data-collection policies, and even botch the rollout of the President’s signature legislation and your job is secure. But dare to mock Joe Biden and you’re fired! A week or so ago, President Obama made headlines by declaring he’s “got a pen” and “got a telephone” and calling 2014 a year of action! My first thought was, “Gee, Batman must be jealous of your high tech gadgets Mr. President.” My second thought was that Obama was actually threatening to bypass the Constitutional role of Congress by acting unilaterally wherever possible. In case there was any doubt about the President’s commitment to Executive action, the White House has doubled down on its promise to circumvent Congress. Watch out, the President has a pen. As President Obama rolls out his poorly-named “Promise Zones” (sounds like something a male adolescent would come up with to name a body part), progressives around the nation are simultaneously pushing for higher minimum wage — places like New York, Detroit, and SeaTac have recently had protests and/or legislation passed over higher minimum wage, just to name a few. And the U.S. Senate has mentioned a “$10-ish” federal minimum wage. By the way, it’s not just progressive liberals pushing for it — in Washington state, a self-described Republican is pushing for $15/hour minimum wage. The article calls him a “conservative”, but we all recognize his progressive ideology. “Income inequality” is shaping up to be the big 2014 liberal campaign platform. The progressives want to re-frame the debate as a humanitarian rather than an economic one. Democrats hope they can ride this horse to victory, and probably even keep riding it through 2016. Never mind the fact that they are essentially admitting to buying votes. Additionally, when minimum wage goes up, it tends to drive all wages up across the board. This exacerbates the above outcomes across the entire economy. The future of fast food service. 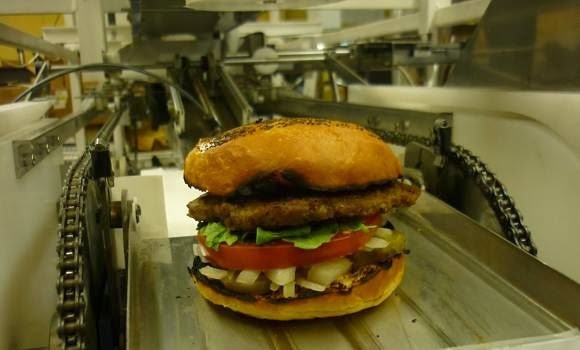 This robot makes burgers faster and better than humans. It got very little play in the press, but President Obama was recently snubbed again on the world stage when 15 Asian nations formed a Regional Comprehensive Economic Partnership without the United States. Obama had traveled to Phnom Penh in an effort to “sell a US-based Trans-Pacific Partnership excluding China.” He failed. Add this to a growing list of major failures by Barack Obama on the International Stage. He failed to bring the Olympics to Chicago. He failed to produce progress on the Israel-Palestine front (it’s actually getting worse). He’s failed to create any sort of consensus on what to do about Syria. He has failed to inhibit Iran’s progress toward a nuclear weapon. There is no doubt that U.S. influence is waning under Obama. Maybe that’s exactly what he wants. The title of this article is polarizing and I expect to get in trouble for writing it. As a homeschooling parent I’m not supposed to think homeschooling superior to institutionalized education. I’m supposed to take the stance that all choices are equal in the effort not to offend anyone who prefers public schooling. It’s a hot topic in the mommy circles and one that most homeschooling moms want to avoid. We all encounter the same comments and exclamations like, “How do you do it? When are you going to put them in real school? You must be crazy! How long do you plan to do this?” or my personal favorite, “I could never do that!” This article is a response to all the times I’ve wanted to answer truthfully but held my tongue in order to preserve peace. Disclaimer: Let it be understood that I believe in the freedom of individuals to choose how to raise their own children how they see fit. This does not prevent me from having an opinion as to the nature of public school and what state-run education inflicts on American children. This is based on personal experience and years of study and research. Further, many of you will argue that none of the examples in this article have ever happened to your child in your school. My answer is, not yet. I warn you, if you are a public schooling advocate and you continue to read this article you may become unhappy with your current choices and find yourself at a homeschooling conference and facing disapproval from your social circle. Read at your own risk. If you’ve got a business, you didn’t build that. Somebody else made that happen. So said President Obama in a particularly revealing address on Friday. Obama has been blasted lately for going so negative, and the full speech reads mostly like the “Hope and Change” he ran on in 2008. I have to wonder if this and other remarks were the result of an unfortunate TOTUS malfunction. It always seems Obama is most revealing when he is unscripted. In any case, there is no doubt that Obama meant this as a shot at those who consider their success to be of their own making. The overall theme of his speech was that nobody is successful without some kind of help, especially help from the government. Unfortunately, Mr. President, somewhere around 24 million small business owners may disagree. And on their side, they’ve got a basic theory about how you grow the economy. And the theory is very simple: They think that the economy grows from the top down. So their basic theory is, if wealthy investors are doing well then everybody does well. Obama is displaying his reliance on demagoguery by willfully distorting the economic theory most conservatives refer to as “Reaganomics.” The so-called “top-down” or “trickle-down” theory has very little to do with wealthy investors, and everything to do with the production of value to the consumer. Think about it this way: do business owners get rich just because they open a business? On the contrary. Most small businesses require a minimum of tens of thousands of dollars of investment to start — often financed in whole or in part out of the owner’s pocket — and at least one-third of them fail within 2 years. Anybody can open their own business, but that alone does not translate into success or wealth. Unless you have powerful friends in Congress who can subsidize ineptitude, your success in business can only be achieved by creating a value proposition which entices consumers to purchase your good or service. Even then it requires many years of tireless labor and painful sacrifice to achieve success. 40 hour workweeks? Hah! Try 60+. 2 weeks paid vacation? There’s no such thing when you’re the owner. When you own a small business, you’re chained to it for the first several years. Some people never break those bonds. So why would anybody ever want to own a business? It is the promise of future wealth which entices people to start (and stick with) a business. In the mean time, though, the owner is busy buying materials, producing products or services that people want to buy, and creating jobs. As economist Thomas Sowell has observed, “Reaganomics” is actually not “trickle-down” in practice. The money goes to the suppliers and employees and the value goes to the consumers BEFORE the owner get wealthy — if they ever get wealthy at all! Only after years of successful enterprise will the typical business owner ever truly enjoy above average wealth. Obviously, this economic theory has nothing to do with wealthy investors as Obama characterizes. It has everything to do with producing value to the consumer, and the presence of a profit motive on the part of the business owner. Unfortunately for all of us, Obama and his progressive cabal seem woefully incapable of comprehending this relatively simple idea. Look, if you’ve been successful, you didn’t get there on your own. You didn’t get there on your own. I’m always struck by people who think, well, it must be because I was just so smart. There are a lot of smart people out there. It must be because I worked harder than everybody else. Let me tell you something — there are a whole bunch of hardworking people out there. Apparently, Obama is saying that being hardworking and smart is not sufficient for achieving success, which makes me wonder, what exactly is Obama’s measure for success? Surely there are millions of Americans who are not business owners and not “wealthy” who can nevertheless be considered successful by most standards. What kind of message is the President sending about success? But returning to the core point, the President is right that there are a whole bunch of hardworking people out there. While hard work can create success for employees, hard work alone is not sufficient to create success for a business owner. Studies have proven what successful business owners already know — the secret to great success goes beyond just dedication, requiring higher levels of sacrifice as well as focused improvement. If you were successful, somebody along the line gave you some help. There was a great teacher somewhere in your life. I’m not going to bash teachers. Teaching is tough, often thankless work. But if all that was needed to be successful was having a “great teacher somewhere in your life,” there would be virtually zero unsuccessful people in this country. At some point in their lives, almost EVERYONE has had a great teacher. I remember having undisputed “great teachers” in high school and college, but not everyone got A’s and not everyone who went through their classroom ended up being successful. Somebody helped to create this unbelievable American system that we have that allowed you to thrive. Somebody invested in roads and bridges. I always love when liberals give the government extra credit for performing the basic duties with which the government is tasked. But even this argument this is spurious. Giving the government credit for successful commerce because they build roads would be like Wal Mart giving their building contractor credit for selling me a DVD. Roads weren’t conceptualized by the government. We The People chose the government to be responsible for our road building. If not the government, We The People would find some other way to have roads built because roads are essential to our lives. The Internet didn’t get invented on its own. Government research created the Internet so that all the companies could make money off the Internet. False. Actually, the government was one of the main sponsors of a project by MIT called ARPAnet, which is widely (but incorrectly) considered the original Internet. However, an “internet” is a connection of multiple networks, whereas ARPAnet was simply a single network. The MIT research was responsible for some of the underlying technology, but comparing ARPAnet to the Internet is like comparing oil lamps to LED light bulbs. At the time ARPAnet was being created, other institutions were already researching ways to connect computers together across short and long distances. ARPA got there first, possibly due to a larger influx of capital; at the time, the U.S. government was worried about being technological underdogs after the Soviets launched the Sputnik project. Nevertheless, anyone who says the Internet would never exist were it not for the government is certainly wrong. Most objective observers agree that it really wasn’t until the government got out of the way, thereby opening the Internet up for private investment, that the World Wide Web was truly born. This is illustrated by the fact that the government’s own standards agency (OSI) actually tried to shut the door on the very same network communications protocol standards (TCP/IP) which are in use by all of us using the Internet today. They believed the technology would never work. Beyond that, consider the underlying infrastructure supporting the Internet. Data travels across a huge network of fiber optic cables. Cables conceptualized and fabricated by private corporations, installed and maintained largely by private corporations, and funded by well over a trillion dollars of private investments, primarily from Wall Street. At the very most, we could say the government accidentally helped encourage some of the basic technology of the precursor to the first version of the Internet while throwing money at any project that might have military application to counter the Soviets. After that, it’s at least plausible that the government’s role actually inhibited the development of the Internet we know today. Consider his argument; the U.S. has the greatest system in the world, yet even here, people cannot be successful without help from the government. “If you’ve got a business, you didn’t build that. Somebody else made that happen.” What does that say about this country, this world, and humanity in general? Not much faith in mankind there! Does Obama’s speech reveal something deeper, something on a personal level? What kind of life experiences must a person have to hold such a belief? Is Obama telling us that his own successes are owed to others? Did he accidentally reveal that he was the beneficiary of some government initiative, perhaps affirmative action? Or maybe that someone else, like Bill Ayers, wrote Dreams From My Father? Let’s review who the Taliban really is, shall we? A few years ago, the Taliban attacked girls with acid on their way to school, blinding and disfiguring several of them. Reuters did a video report on one of the incidents. Watch it, but only if you are ready to be sad and angry for awhile. More recently, the Taliban has been poisoning schoolgirls in an apparent effort to discourage them from attending school, and/or to undermine the Afghan government. I ask you, do militants who rule with an iron fist, starve and slaughter their own people, and poison and burn young girls with acid just for wanting to learn seem like reasonable human beings? Most of us would say no, but President Obama says yes. These are the people with whom Obama seeks accord. These are the people Obama believes can be part of Afghanistan’s governing body. Look, I can’t claim to be an expert on foreign policy, and I’m definitely torn on whether or not it’s worthwhile to continue the war in Afghanistan, where our young men and women are dying and getting seriously injured. But to actually engage in direct talks with an organization of terrorists as evil as the Taliban is an insult to every soldier who has given his or her life to see that country saved. To give them the prestige of being recognized internationally, on television, by the most powerful man in the world as an invited player to the negotiating table is to concede that America no longer stands defiant in the face of such terrible evil. We are no longer seeking an Afghanistan that is safe for women and girls to learn and pursue their own dreams. Instead, we seek an exit strategy. Political expedience is the rule of the day. Obama wants to check a box on his list of campaign promises. In essence, he is willing to casually trade the lives and futures of hundreds of thousands of Afghan women for a better chance at winning reelection. Bold leadership, no doubt.